How to roast eggplant on open flame? Want to know how to roast eggplant on open flame. 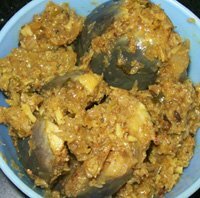 This roasted eggplant can be used to make Baigan ka bharta, mashed eggplants or any other dish where you need roasted brinjals. Roasting eggplant is one of the ways of cooking eggplant. Many Eggplant recipes ask for roasted eggplant. Other ways are stir frying, baking etc. You can use gas stove, grill to roast eggplant. You can also roast it in an oven or using on charcoal. Charcoal roasted eggplant has a wonderful flavor. But the one roasted on gas is good too. Depending on your requirement, you can roast one two or three eggplants in the similar way. You can roast them all at the same time on different burners or roast them separately one at a time. 1. Choose large purple eggplants. Wash and dry well. Apply a little oil all over the eggplant. Place the eggplant on the direct flame. The flame should be on medium. 2. 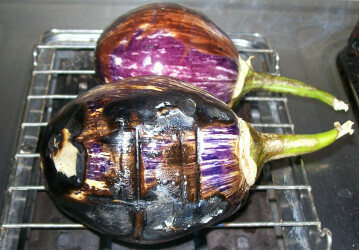 The eggplant skin will start to change color as it gets roasted - see the image below. Rotate the eggplant once in a while, so that it gets evenly roasted on all the sides. 3. The skin becomes charred and starts cracking. It is very easy to peel the eggplant after it is roasted. 4. Once the eggplant is roasted well all the sides, remove from fire and put it in a bowl and cover it till it cools a little. If any inner part of eggplant is not yet cooked properly, it will get done when you cover it like this for 10-15 minutes. 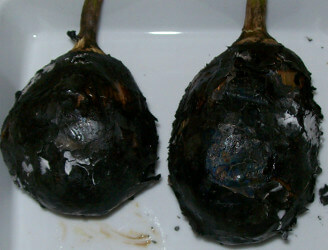 You can see in the image below, roasted eggplants with charred skin. There are ready to be skinned. 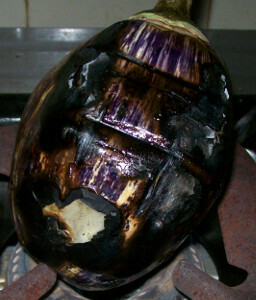 After some time, when the eggplant has cooled, remove the black charred skin carefully. It comes off very easily. For doing it neatly, keep a bowl of cold water on hand. Dip your fingers in the water once in a while and keep peeling the skin away. It will come off fast and will not stick to your fingers. Depending on what you are planning to do with the roasted eggplant, you can mash it using a fork or a slotted spoon. Cut up any threads using a knife. Now the mashed eggplant is ready to use for your recipe. Use large eggplants but not too large. Too big eggplants may not cook properly in the center. Keep the flame medium. If the flame is too high, the skin will get charred faster but the insides may remain uncooked. Remember to turn the eggplant once in a while. When you are roasting, do not go away for long. You can leave the brinjal to cool completely or if you are in a hurry, peel it after it is cool enough to handle. 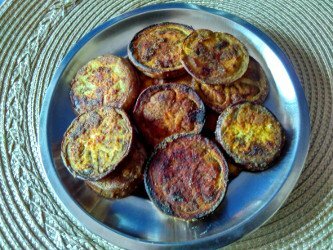 You may store the roasted and mashed eggplants in the fridge for 2-3 days and use when you want. 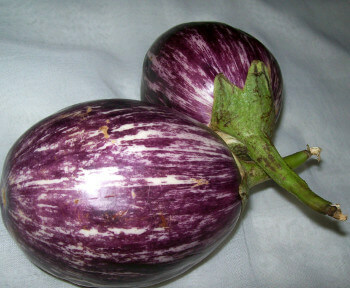 You may stick in garlic cloves in the eggplant before roasting to get garlic flavored roasted eggplant. Maharashtrian Vangyache bharit recipe with tamarind and jaggery.